To read Lloyd Zimpel’s superb new novel (his first in 40 years and well worth the wait), “A Season of Fire & Ice,” is to be reminded, in gripping detail, of the pride we can all take in immigrant American grit….Zimpel tells his tale with masterful economy, and yet with a rich linguistic vein that brings the 1880s alive as swiftly as his compendious knowledge of the detail of farming a century and more ago. As a novelist, and not just as a historian, he is also the master of his craft…a true page-turner. The suspense, as the neighborly drama unfolds, tightens like a tourniquet. Compare the hold such a tale exerts on the imagination to the experience of reading contemporary novels in which so much anguish is expended on a life of so few rigors, as opposed to the Praegers’ seasons, as Zimpel says, of fire and ice. …But these are not pages of poverty-stricken lives. At the worst of times, the food Ma Praeger manages to conjure up will make the reader salivate. The fields may be barren when times are hard, but human resourcefulness is celebrated on every page of Zimpel’s book, and there is a glory in it. 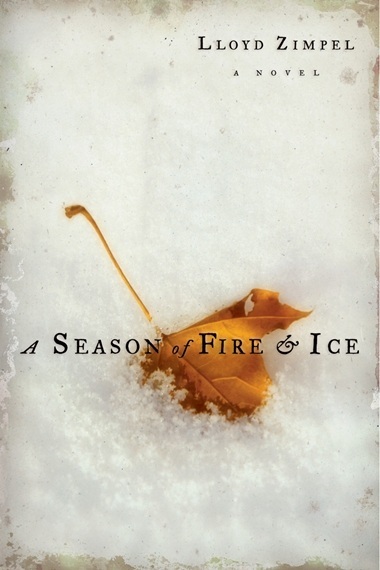 It’s this, and not only the suspenseful writing, that makes “A Season of Fire & Ice” so hard to put down. This is a splendid book, and it belongs on every reader’s bookshelf as a reminder of the forging of America. “A skillful evocation of a time, a place, a temperature.…a stark morality tale told with tongues of fire in a landscape of ice. From the heartlands of the 1880s Upper Midwest comes a morality tale of survival and destiny told in the convincing language of a patriarch’s journal, evoking a real sense of the time and place. Gerhardt Praeger, a farmer of some education and plenty experience, understands the mixture of hard work, ingenuity, ethic, grace and steadiness of spirit needed to hold his settler family and neighboring community together while homesteading the hard territory of the Dakotas. He, along with his wife and seven sons, must constantly contend with natural disasters and manmade challenges to carve out their holdings in an unforgiving environment that has defeated so many of their neighbors, sending them home to their families back east. Praeger believes that God will provide sufficiently if not in abundance to those who can resist over-reaching. But a new neighbor, the bold Beidermann, who seems at times almost larger than life, stirs both his curiosity and envy, and tests Praeger’s moral beliefs. Between his remarkable journal entries that observe the increasingly tense events between them, is also a narrative that moves the everyone toward calamity. What results is an almost biblical story of moral imperatives and self-revelation, of man striving to civilize his own impulses along with the wild land. By God, says Beidermann, but you are a tough customer to please. You do not like my team and you do not like my dogs. Is there anything else about me that you do not like?—But if he wants an answer he does not wait for it. He turns away to tie his handsome team to a sapling, and retrieves his ax from the sledge, and hefts it from hand to hand as its flared blade glints: he has shown it to me before—a tool from the Old Country, he claims, in a manner as to say it has magical quality. Throughout the forenoon the clouds lower and the weather grows gray. We sit on the trimmed logs to take our dinner of the wurst and cheese and hardboiled eggs Ma has packed. Beidermann eats his meat and bread with lard without talking and, finishing, wipes his mouth with the back of his mitten and pronounces: It will snow some. The twins receive this with the gravity they give all Beidermann’s opinions, even ones as unremarkable as this, and stop kicking snow at one another to cast sober eyes to the sky and to Beidermann and to me—as if I might challenge Beidermann’s certainty, as I am often more than willing to do, if only to deflect somewhat the twins’ excessive admiration of him: and while I have not been much successful at this before, I lose more ground now; for Beidermann flatters them by requesting they take his team—his mighty Percherons!—to skid out the logs that remain. To be offered the reins of Pegasus would thrill the lads no more; as with dwarf hands on the leviathan’s bridles into the woods they plunge, and with manly cries come thundering forth, a snubbed log pitching behind in a rain of scraped bark and ice, as the two leap nimbly through the whipping hazelnut branches and dead blackberry vines. Beidermann’s snow comes; with little wind the large flakes, fat with wetness, descend through the still sky in such abundant quantity as to obscure us from each other and muffle the sound of Beidermann’s steady ax. . . .
His sledge is near loaded; and I go to bring my team forward, to take on the last load, as the snow falls near as thick as fog, to mute the sound that now comes to my ears: a queer, grunting bellow, like the belly-deep groan of a man wrenching himself from a nightmare. (I have heard it since, in my mind, often.) I cannot see Beidermann; and the twins, at a distance into the brush, draw up at the ugly sound and look back to me, knowing I am not its source, but for assurance that no threat lies in it. I cannot offer it; for I am no less alarmed than they, and it is with dread that I push through the brush to where the sound of Beidermann’s ax has ceased. He lies an arm’s length from its bloodied blade; upon his side, on one elbow, like a man reclining at a Sunday picnic. But he lies on no pretty blanket upon shaded grass; but instead in a bed of trampled, dirty snow and torn branches, and he twists his face around through a screen of falling snow and in a quiet rage says, Now I have done it, for damned sure.